Posted on March 19, 2015 at 11:55 am. This year in BC we are blessed with an early spring. At the Ashram, we are delighting in fresh greens tender from the greenhouse. In Vancouver, where I am visiting with the Temple committee, cherry blossoms and magnolias are magnificent in their fullness. Daylight stretches out and the world awakens. Everything seems possible! Choices abound like a welter of seeds seeking fertile ground. How to choose wisely? The Ashram, as always, is in change too. In times of transition it is helpful to have a centre point to return to. Along with the mantra and the Light, I coach myself with the wisdom that Swami Radhananda passes along to me, “Just be there. That’s what the Ashram needs; that’s what the president does. Just steadily be there.” I am not responsible for solutions but for listening and opening to what is and what will be. Message to self: Open so the Light can enter. Be joyful, dance – it’s spring! Our spring retreats and workshops are coming up. Register now! Hatha Yoga Teacher Certification: After completing the Yoga Development Course, the next step of our Teacher Training program is the Hatha Yoga Teacher Certification. The approach is experiential – learning through teaching in small groups. View the full 2015 program calendar here. Calgary, London (England), Nanaimo, Spokane, Vancouver and Victoria.Or start thinking ahead to fall; we have a weekend retreat planned for Ontario plus workshops in Toronto, Ottawa, Montreal and Halifax. Learn more. A special offer of five greeting cards and a package of Ashram flower seeds. 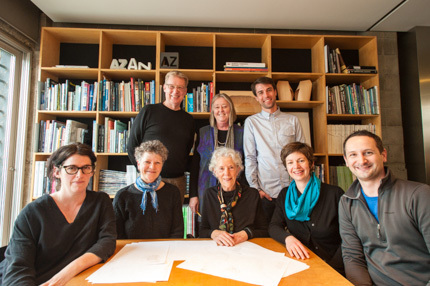 At the beginning of March, the Temple design hub went on a field trip to Vancouver to meet at the offices of Patkau Architects to discuss the conceptual design of the Temple’s auxiliary outer building and surrounding land use. We looked at the practical functions of reception and service spaces. The Temple needs washrooms, storage, flower arranging and altar supply space, a coat room. But we also asked ourselves, what is important about how we approach the Temple? How does the Temple receive aspirants with grace? How can we create a space where taking off shoes and coats can also be a sacred act? The land is part of the exploration as well. How do we bridge the ‘heavenly’ Temple and the ‘earthly’ landscape? There is so much possibility in creating pathways, meditation spots, outdoor satsang areas, forest access, lake views, all within the Temple grounds. We hope to discover new ways to be in the presence of the Temple – from the outside in, from the inside out. Thank you to the Patkau team for having us at the office! We are so grateful for the creativity and spark they bring to the Temple project. Creative ideas are stirring and blossoming for self-organized fundraising toward the new Temple of Light. People are also coming together to prepare exciting events, such as inspiritus – a cross-cultural celebration of spirituality-in-art symposium at the Shatford Centre Okanagan School of Arts in Penticton. Ruth Campbell and Parama are among the organizers of this symposium proposed for October. 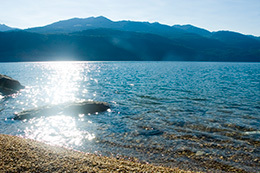 Yasodhara Ashram will provide information about the new Temple, as well as offer workshops. Start germinating your ideas now! Many seed ideas can help us grow a new Temple! Thanks to all for your efforts. Three women in the 2015 Yoga Development Course recently reflected on their experience of the 10 Days of Yoga as fertile ground for future growth. The 10 Days of Yoga is offered four times this year. Consider it for yourself or for someone you know! Karma Yoga – Just do it! 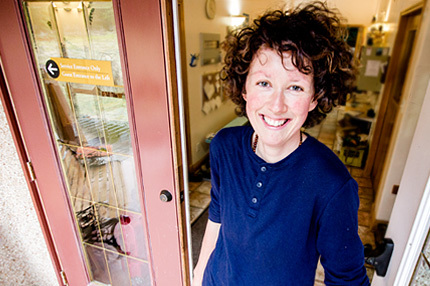 Molly Askey-Goldsbury has a message for anyone considering the Ashram as an intern or karma yogi: “Just do it.” Molly spent seven months as a kitchen-garden intern last year and has returned to lead the garden through the 2015 season. “I’m excited to be here again and look forward to what will unfold. Living in a spiritual community has proven to be fertile ground for growth, both personal and professional. Being an intern gave me the time and space to explore, to question and to challenge myself. It gave me the confidence to leave the work I had back in England and to return to the supportive atmosphere here as an incubator for something new. “It’s a unique experience at the Ashram. I’m surrounded by people who offer support with such sincerity. I get to participate in fantastic weekly workshops. Last year, I also took a course with other guests and I was just glowing afterwards. The life-long gifts I receive here are amazing. Look into the many ways of being at the Ashram, including internships (currently seeking for six areas) and Karma Yoga (short-term or One Month Program). Every evening for the past 53 years the Ashram has offered mantras at satsang for those who’ve asked to be on the prayer list. 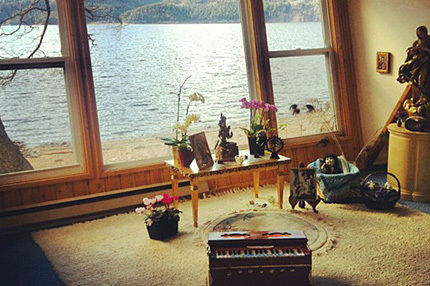 For many of these years, satsangs were held in the Beach Prayer Room – a space where Swami Radha also had her personal practice. Laura Vanags, currently participating in the Yoga Development Course, brought together her experience of the Beach Prayer room, her mantra practice and her talent as a photographer. Contact info@yasodhara.org if you would like to have your name placed on Yasodhara Ashram’s prayer list. 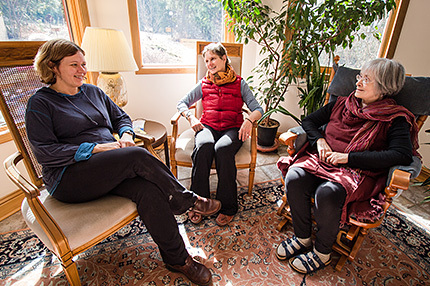 Yasodhara Outreach is growing in many directions, with Ashram teachers offering an array of workshops and retreats this spring and fall across Canada, in the US and England. Review the dates and make your plans now! 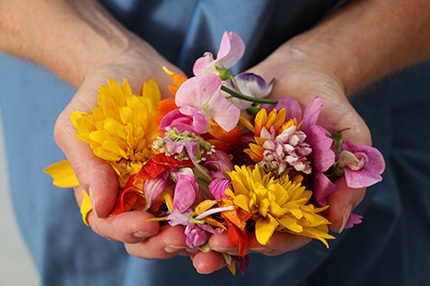 Closer to the Ashram, a Spring Renewal workshop will be offered in Nelson on April 18. 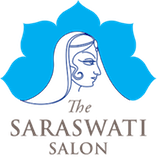 We revitalize and expand our community by sending teachers to your area. In October, Swami Lalitananda and Alicia Pace will attend the Parliament of the World’s Religions in Utah. Ten thousand participants are expected from eighty countries in the world’s largest and most historic interfaith gathering. Swami Vivekananda is remembered for his speech about yoga and Eastern philosophy to the first Worlds Parliament of Religions in Chicago in 1893. Contact us if you want a workshop in your area or if you hear of a conference that would be open to our contribution. 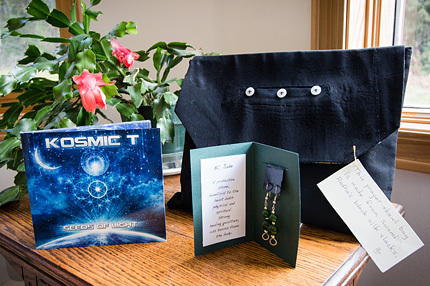 Another option is to bring your group to the Ashram, where we can customize a workshop or retreat for you. outreach@yasodhara.org. 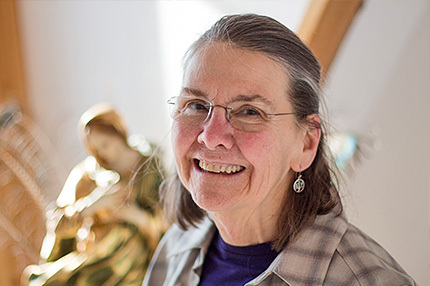 Near the end of her Yoga Development Course in 2013, Sheila Thomsen asked herself in the Little Bridge pose, “What am I bridging?” To her surprise, the answer was a clear “Yoga and Catholicism.” Since then, she uniquely combines the two through teaching Yasodhara Yoga in Catholic contexts. An important part of my Catholic spirituality is my 25-year connection to the Monastery of St. Gertrude, a community of contemplative Benedictine Nuns in Cottonwood, Idaho. When I visited the monastery after completing the YDC and Yasodhara Hatha Yoga Teacher Training, my spiritual director suggested that I teach yoga there. She recognized that my spiritual understanding had shifted from my head to my heart. I have since been delighted to offer classes during a weeklong silent retreat and a “Praying with the Body” retreat. I’m looking forward to another silent retreat in June. It will be quite a contrast to my involvement in busy Family Week at the Ashram, which I am equally enthused about! During this time of bridging, I’ve clearly understood the similarity in the spiritual practices that I learned in yoga and in the Catholic Church. I no longer worry about choosing between two paths. There is really no choice to be made. What I am is a Catholic yogini. 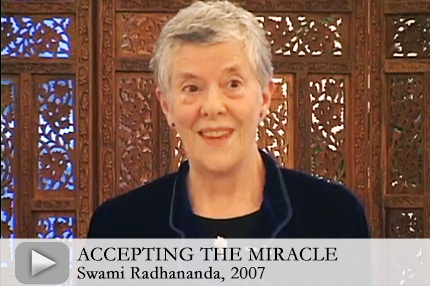 Swami Radha’s Birthday – On Friday, March 20, we will celebrate Swami Radha’s birthday with special devotion, dinner and dance. Is it any wonder, with her birthday at Spring Equinox, that she brought so much Light into our worlds?! Internship Applications Extended – It’s not too late to consider whether an Ashram internship would be your best next step. The deadline for application is extended to March 25. Check out what is available here. Garden Starts Spring Growth – Our organic garden is a huge contributor to our sustainability efforts. It all starts with spring! See what’s growing in our recent Facebook posting. Families Welcome Anytime – We want to remind you that families are welcome at the Ashram any time of the year! Although Family Week 2015 is full, please call 1-800-661-8711 if you would like to be added to the waiting list. Ashram Greeting Cards – The Bookstore now features 35 beautiful new greeting cards of Ashram scenes. Plan to stock up when you come. Or check out the special Online Store package of five “flower theme” cards and Ashram flower seeds. Teacher Renews in Many Ways – Long-time teacher Shanti Peck of Nanaimo recently spent two weeks at the Ashram, teaching, renewing herself and using her sewing skills to recover our soft Hatha mats. See a photo of the result on Facebook. We invite all teachers to come this year for renewal and giving back. YDC Gifted from Holland – Mid-way through their course, YDC participants received a delightful gift box from Judith Grob of Holland, a 2012 YDC alumni. See more on Facebook. Determining and putting your ideals into action provides a firm foundation for your life. Start by considering what the term “ideals” means to you. Then make time for some of the following reflections or take them into your classes. We thank the yoginis of Yasodhara Yoga Calgary for gathering these reflections for your benefit. “Just like in Kundalini Yoga, you start at the beginning by asking yourself, ‘Why am I here? '” (Living the Practice, page 205) Do the Divine Light Invocation. Stand in Mountain pose, in the Light, listening. Ask yourself and reflect on: Why am I here? What kind of person do I want to be? Write out your ideals on a special piece of paper, or with your favourite pen or font. Create an art project with the list, similar to Likhita Japa. See more on the Ashram website. To greet the morning of your ideal day, do a Sun Salutation while repeating the Divine Light mantra. Ask yourself and reflect: How can I keep my ideals in mind in my daily activities? What is my plan? How can I keep it simple and compassionate?